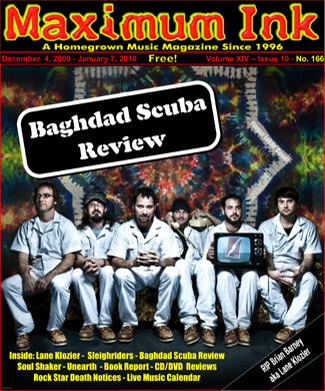 Since their inception Baghdad Scuba Review has been swimming through the sands of creativity and their existence has bloomed and flourished because of it. When their dynamic and thematically charged jam rock debut “Testing The Waters” flowed into our ears in 2007 it was critically acclaimed and nominated for a MAMA award. Since then the band has played numerous shows and events around Madison and the Midwest, highlighted by memorable sets on the Capital steps for the Great Midwest Marijuana Harvest Festival, in Black River Falls at the Grateful Garcia Gathering, and at Milwaukee’s incredible Summerfest. Recently Chad Thompson (lead guitar/vox) and Justin Gerstner (drums) took a moment to update Maximum Ink about what’s percolating these days for BSR and what their next release (slated for an early 2010 release) holds in store. The rest of the band is composed of Erik Riedasch (bass), Rob Bloch (percussion), and Jason Krueger (keyboard). Since their politically charged debut release, the country has leaped to a new perspective both from the White House and in economic terms. How has this affected BSR? Each summer brings new opportunities to experience and enjoy in the form of outdoor music festivals. BSR has had the opportunity to frolic and play at a number of such events. 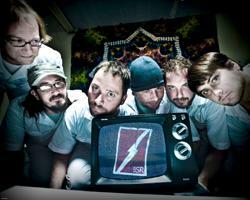 BSR will be playing on December 17th for the Maximum Ink Holiday Party at the Frequency along with Madison’s El Donk.